Sackett Family Association member Albert M Sackett has died at the age of 95. Albert was an occasional contributor to the Sackett mailing list and kept in touch with individual members. At the time of my last correspondence with him early last year, he was still playing golf aged 94. 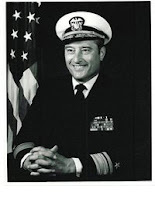 Rear Admiral Albert Monroe Sackett served in the US Navy for 40 years. During his career he fought in three wars: World War II, Korea, and Vietnam. His genealogical sketch in Notable Sacketts on the Sackett Family Association website includes a detailed obituary—compiled no doubt with meticulous accuracy as Albert wrote it himself!